The transport of chloride ions (Cl–) across biological membranes is essential for life; it is a core component of fundamental physiological processes. In plants, these processes underpin productivity and crop yield. 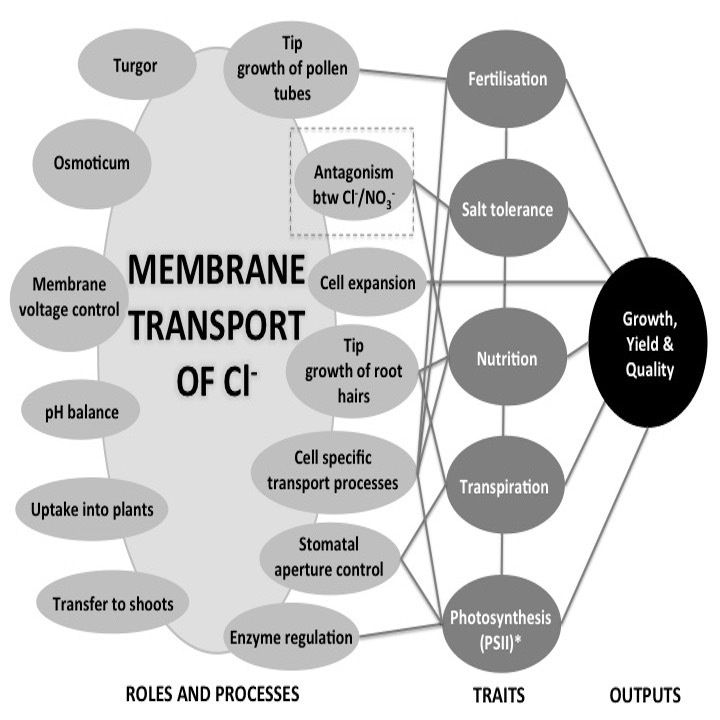 Without sufficient Cl–, plants cannot photosynthesise, reproduce, control membrane potential, turgor, transpiration, and nutrient uptake. In contrast, excess Cl– in the plant body will inhibit these processes and reduce yield. This occurs through its direct toxic effects on cellular metabolism and by reducing the nitrogen (N) status of plants – N is the main mineral nutrient driver for plant yield as it is usually required in the largest amounts. While N-transport pathways are well described in plants, the molecular components that transport and regulate the majority of Cl– within the plant remain poorly defined. Critically, this includes the identity of the proteins that control the flux of Cl– into roots and shoots, which are central to plant nutrition and salt tolerance. We aim to discover the molecular identity of these proteins, and to determine the nature of the antagonism between Cl and N uptake. See a recent update on progress in the field here.